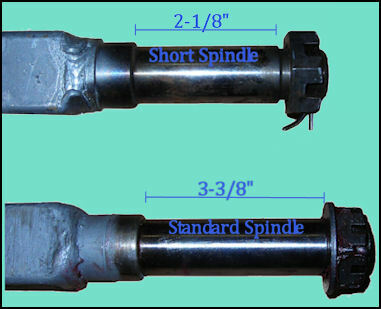 There are a few common spindle sizes found on Trailer Axles rated at 3,500lbs or less. These are the most common axles found on Boat Trailers, Small to Medium Sized Utility Trailers, Snowmobile Trailers, and more. There are 4 main areas of importance on the spindle to consider when purchasing a Trailer Hub or Bearings. They are, Seal Surface, Inner Bearing Surface, Outer Bearing Surface, and Thread Surface. 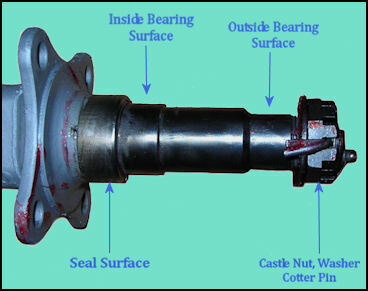 *Hub Length is the distance through the center of the hub from casting edge to casting edge. A “Standard Spindle” hub will measure between 4” and 4-1/16” while a “Short Spindle” hub will measure 3-1/2”.